You can now donate a considerable amount of money to a charity of your choice without digging into your pockets. We help your organization or charity accept donations in the form of old gold, silver, or platinum. 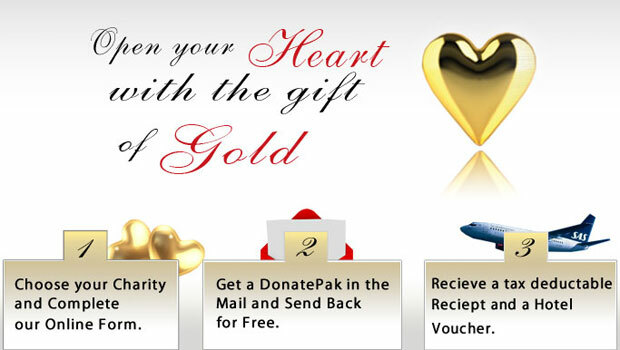 All you have to do is request a DonatePak, and send in your scrap gold or precious metals, with free shipping. Your gold will be insured by FedEx, and you’ll be able to track it all the way to our plant. Once assessed, a check for the full value of your gold will be sent to the charity of your choice, and you’ll receive a tax deductible receipt, along with a vacation voucher.